We're nearing the end of these posts. Going to cover a few more skill systems and then do a final overview and conclusion piece for the series. This is the core of rolemaster. You have a 'bonus' to each skill that you add to a 1d100 open ended die roll. The final total you get determines your degree of success. You need over 100 for a total success. Though you start achieveing partial successes at 70%. Note that this is different from the Hackmaster style 'roll-under' system, because here it is an advantage to roll high. 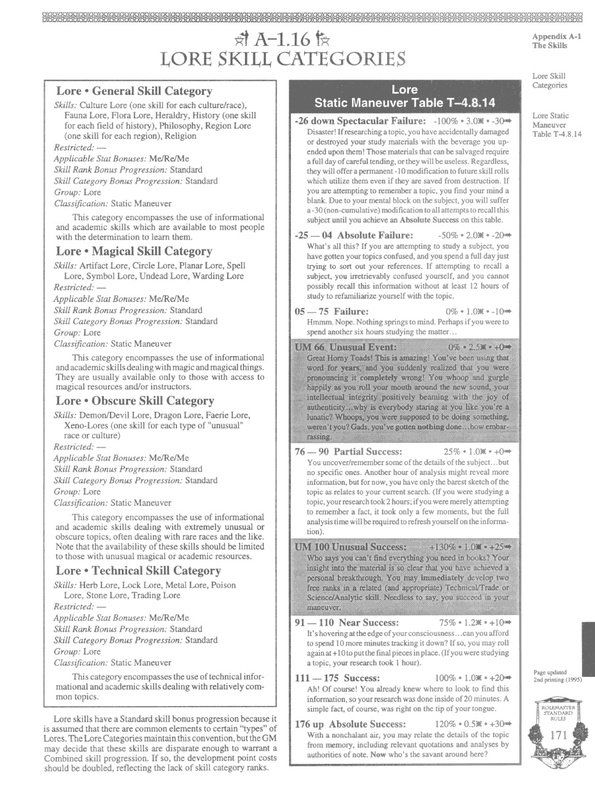 Of note is that Rolemaster allows you to increase all skills in a category at once. It limits skill increase by restricting what you can spend per level based on your class. It is rather inventive and coherent, if not a little crunchy. So, how do they work? Well, much like D&D, it is a unified system, meaning any action, from attack to running to attempting to open locks uses the same open ended resolution system. 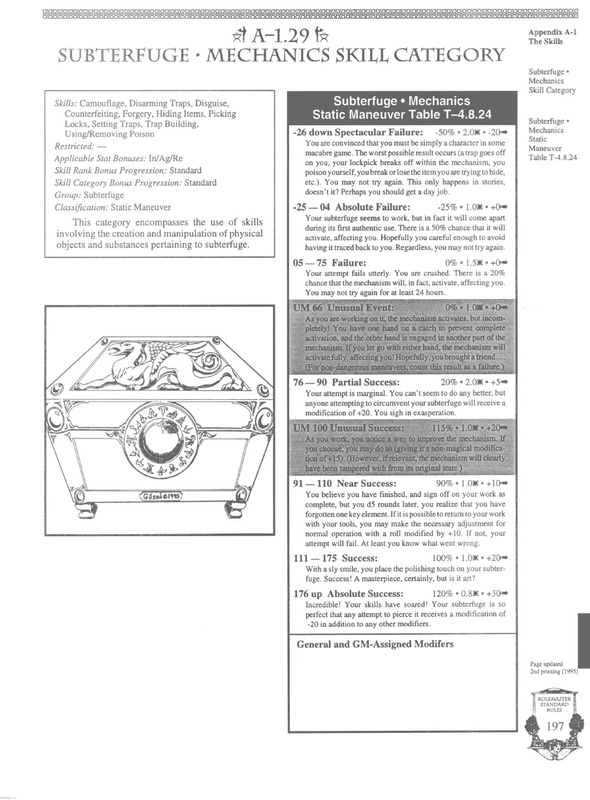 Since we're focusing on the 'skill system' here, I'm only going to talk about 'static maneuvers' which are what Rolemaster calls their skills. First, the Gamemaster always assigns a modifier from +30 to -70. Since 100 is the minimum needed for a total success, we can equate that to a basic success DC of 20. This means for every roll you are adding a modifier from -6 to +14 to the roll. Or conversely setting the DC from 14 to 34. Sounds pretty similar to the D20 system, no? So in what ways is this different then the Dungeons and Dragons system? There is little guidance in the rulebook about when to use skills, and the indicators certainly point towards using the skills for all activities. "Blackfire has strained his shoulder after trying to shave his back. . ."
"Solrac has managed to injure himself reaching for the toilet paper. . . "
"Snidepucker the rogue dies after eating a poisoned bagel. . ."
So, it's complicated, requires constant book reference, has the same universal mechanic for everything, and wants you to roll skills for everything. This seems like a list of things I hate. Why would I be ok with running this system, whereas I find the D20 system dull? (And, no it isn't because I have some twisted compulsive love of tables). It's because the system takes specific factors, resolves them abstractly, and returns a degree of success, making for interesting play. Player skill is taken into account by trying to stack specific factors, limited by the length of time in a round. The complexity of skills encourages you to hand wave them if not in a time crucial system. The fact that these specific factors are resolved into an abstract result consisting of degrees of success allows it to be applied to play in an entertaining manner, setting up more entertaining systems. TL; DR? Because it works as a boon to our creativity! Why? Let's look first at something I deem a useful skill, and then something useless like knowledge skills and why they both work for me in Rolemaster. . . 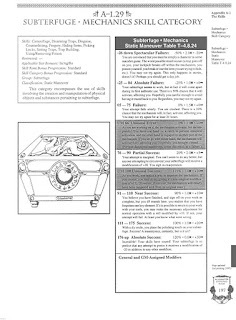 Results table for Camouflage, Disarming Traps, Disguise, Counterfeiting, Forgery, Hiding Items, Picking Locks, Setting Traps, Trap Building, Using/Removing Poison. . .
-26 and down: You are convinced that you must be simply a character in some macabre game. The worst possible result occurs. You may not try again. This only happens in stories, doesn't it? Perhaps you should get a day job. 91-110 Partial Success: You believe you have finished, and sign off on your work as complete, but d5 rounds later, you realize you have forgotten one key element. If it is possible to return to your work with your tools you may make the necessary adjustment for normal operation with a roll modified by +10. If not, your attempt will fail. At least you know what went wrong. And now for one I don't like as a skill, but which Rolemaster empowers me to make interesting. This is a result table for Culture Lore, Fauna Lore, Flora Lore, heraldry, History, Philosophy, Religion Lore, and Religion. -26 or lower: Disaster! If researching a topic, you have accidentally damaged or destroyed your study materials with the beverage you upended on them. Those materials that can be salved require a full day of careful tending, or they will be useless. Regardless, they will offer a permanent -10 modification to future skill rolls which utilize them even if they are saved from destruction. If you are attempting to remember a topic, you find your mind a blank. Due to your mental block on the subject, you will suffer a -30 (non-cumulative) modification to all attempts to recall this subject until you achieve an Absolute Success on this table. 76-90 Partial Success: You uncover/remember some of the details of the subject. . . but no specific ones. Another hour of analysis might reveal more information, but for now, you have only the barest sketch of the topic as relates to your current search. 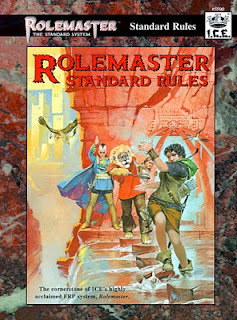 Now there are things about the Rolemaster system I don't like - advancement is tied to levels, so you can't improve in skills without gaining levels. However, allowing increases in both categories and specific skills, abstract results allowing partial success and encouraging player skill are all things that the D20 skill system lacks. Ah Rolemaster...we used to tell our GM to just save up our XP because we didn't want to go through the hassle of leveling. If your typical crunchy system is granola, then Rolemaster is gravel. We had some fun, but your GM really had to know the system like the back of his hand or you'd be there all night with one minor combat. My crowning achievement in the game: my archer maxed out rolling double open ended on the large creature critical table. There's not a single set of game rules that is perfect. Common sense is important when reading and applying the rules. I'm a big fan of RM no matter how crunchy it is. Good post BTW! RM has been my go to fantasy system since '87. It's a great game, but does require better organizational skills than most. In regards to when to use skills, this is left up to the GM; as is deciding which skills to include in the game. Flexibility is the goal. You can have PCs roll for almost every conceivable action, or as few as you want. RMSS is very much a toolbox system; more-so than the versions that preceded it. Unlike most systems, tinkering is pretty much a requirement rather than an option. RMSS was meant to be a kitchen sink book for most genres through near future. As a GM, you really need to go through the skill lists and drop skills which are unnecessary and/or redundant for the setting you're using. My group have recently discovered OSR games and we had a lot of fun with LL. To the point that OSR is becoming our favorite style of playing. But we tried Rolemaster and it was a big let down, the skill system and skill resolution was a nightmare. Compared to LL, everything felt sluggist, bogged down, over-complicated and over-granulated. At first we were excited by all the skill tables and critics, but when we played we discoverd that it din't bring much to the game. We had other issues, but the skill system was the main reason we moved away from this game. I admit that I am a little confuse now after reading the article. Maybe we just din't get the spirit of the game or we din't understand how it is played. LL (and now LotFP) feel far more intuitive and fun to use at the table. You know your three examples of skills being used for everything were intended to be lighthearted example situations there to demonstrate the skills bring used. Plus the second two aren't even skill checks. The toilet roll one is about permenant negatives from damage, and the third is probably a resistance roll to avoid poison. You can use the skills as much or as little as you would like. Hi there, I also love to investigate and discover different skill systems but I have a problem with the Icecrown systems. 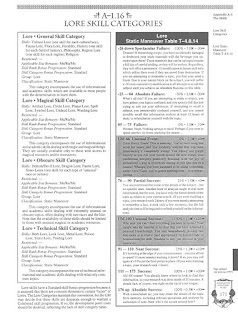 I would like to ask people here if they find the skill system in the open d100 as frustrating in the lower levels; more than Rolemaster I love HARP, a much simplified and polished version in my opinion, but the fact is taht in the Icecrown systems characters start to play with maximuns scores around 40 or so, and thats only at their best. I really think after reading many editions the system is simply broken that way. If you dont start with level 3 or 4 characters or so they are gonna be incredibly incompentent. Much of the time even acomplishing a partial succes is a joke. What do you think about the subject? I think success rates starting out around 30% and increasing to about 80% over a year of play is about ideal.